Rajni Jogiyal did her schooling till 8th standard, after that she got married and came to Dehradun. She learned embroidery and is working with Himalayan Tapestry since 2011. 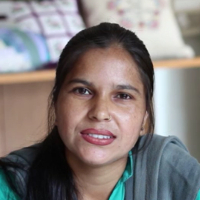 "After getting married I came to Dehradun and have been working with Himalayan Tapestry since 2011."